Hunting fall turkeys is not for every turkey hunter. It is a different game than spring hunting. It requires woodsmanship, patience, and a lot of luck. Most importantly, it requires accepting failure. You will fail many times. The true sport of fall hunting is locating a family flock of turkeys, successfully scattering them, and calling a legal bird to the gun. Family flocks consist of an old hen with this year’s hatch. Alabama, where I almost exclusively hunt fall turkeys, has a fall season in only five counties, one of which I am blessed to hunt in. Alabama’s fall season opens the third Saturday in November. This means that the family flocks typically consist of 6-8 month old hens and jakes, in addition to the old hen. These birds have spent every waking moment together since they hatched. They braved it through summer and early fall together, avoiding predators, insects, and disease. They are at a stage in their life when they do not want to be alone. When scattered, the turkeys become very vocal and have a pressing need to get back together with the flock. Setting up in the middle of a scattered group of highly vocal turkeys and calling them to the gun is a thrill like no other. Mature gobblers also form bachelor groups in the summer and fall, but targeting a bachelor group of gobblers is for those with unreasonable expectations. Of course, it can be done, and I have done it and have seen it done, but you cannot scatter a group of gobblers and expect them to call excitedly and rush to get back together. They are grown men and seem to enjoy the time away from each other. They can be ambushed, but ambushing a group of turkeys, at least in the Alabama piney woods or river swamp, is no easy task. Springtime gobblers thinking about hens are much easier to ambush. Fall hunting, to me, is more about scattering the turkeys and calling them to the gun, and scattering a family flock typically leads to the most exciting hunt. 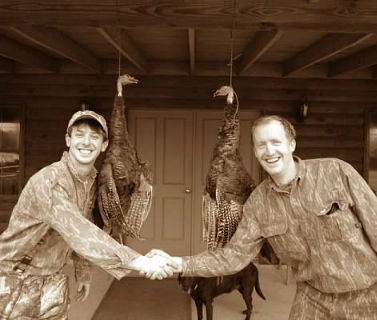 Alabama only allows the harvest of jakes and gobblers. Since I target family flocks in the fall, I am targeting jakes in the fall. Many states allow the harvest of a hen in the fall, and, in such states, I do not object to a sportsman doing so, although I find shooting hens to be counter-intuitive from a management perspective. Consistently locating groups of turkeys in the fall, especially in heavily forested areas, requires a lot of luck and covering a lot of ground. In the fall of the year, a group of turkeys feeding in the woods can be heard from a considerable distance. As such, the best method for locating a group of turkeys after they have left the roost is to quietly walk through your hunting area, stopping to listen as often as time allows. At least in the heavily wooded areas I hunt, very rarely are groups of turkeys spotted prior to being heard. Focus your search around areas with large amounts of scratching, droppings, feathers and other turkey sign. On rainy days, the birds will typically be in open areas, such as roads, fields and pastures. On particularly windy days, the birds tend to stay in bottoms or along windbreaks to avoid the wind. The bottom line is they could be anywhere. Of course, locating the preferred roosting areas of a family flock of turkeys drastically increases your chance of running into them. Once located, do not rush the scatter. Listen to the turkeys and try to determine where they are headed. Getting as close as possible to them prior to scattering increases your chance for a better scatter. This requires being patient and thinking about each move. It is up to you at this point. Once located, orchestrating a successful scatter is key. A successful scatter requires that the birds scatter to all points of the compass, preferably alone. The birds may scatter in pairs or small groups, which is not ideal but sufficient. Each jake in the flock who finds himself isolated after the scatter becomes a potential quarry, and the more “alone” he feels, the better chance you have of calling him to the gun. Turkeys instinctively fly when confronted with danger, as it is usually the quickest escape. When family flocks are broken up and forced to scatter, they fly to trees and stay roosted until the danger leaves the area. The best time to scatter turkeys is while they are on the roost. This is due to the fact that you can usually get closer to the birds and put more thought into your approach and technique when they are stationary in the trees. Scattering can be done by running at the turkeys and yelling like a wild man, with the use of properly-trained dogs (where legal), or by firing a shot in the air. I have found that nothing is effective as firing a shot in the air, though I have unfortunately never hunted fall turkeys with dogs, so I cannot speak to its effectiveness. The firing of a shot, unlike yelling, causes the turkeys to immediately fly in whichever direction they are currently facing. When roosted, turkeys are typically facing many different directions, which often results in a well-distributed scatter. This can also be true when groups of turkeys are feeding on the ground, however, if they are all walking in the same direction, a fired shot may cause them to all fly in the same direction, which is problematic. If turkeys are feeding on the ground, it is usually more effective to sneak within 100 yards of them and run directly at them screaming like a wild banshee until the first one takes flight, then fire a shot in the air. It seems they all begin to panic and start looking around, and the shot sends them flying in whichever direction they are looking. Keep in mind that safety is of utmost importance when scattering turkeys. Be very mindful of your surroundings, especially if you are hunting with a partner, and have a gameplan for each scatter, keeping muzzle control at the top of the list. Again, the ultimate goal is to have the birds fly in different directions, so any way this can be accomplished will work. After the scatter, try to position yourself in the dead center of all the turkeys. Oftentimes this means setting up from the location they scattered, which is not a problem as turkeys often re-group from the exact location they scattered. Being well-hidden is even more important in the fall, as there are usually more eyes in the woods looking for you and the turkeys could come from any direction. If you scatter a group of turkeys off the roost in the evening, be sure to build a blind for the morning hunt before you leave the woods in order to save time and avoid the associated noise in the morning. Turkeys scattered off the roost in the afternoon will typically stay scattered throughout the night, and are very successfully hunted the following morning. After the scatter, once the turkeys have made up their mind that the danger is gone, the turkeys will begin tree calling and kee-keeing to locate the rest of the group. This usually begins 30 minutes to an hour after the scatter, but I have seen it happen minutes after the scatter, as well as many hours after the scatter. You need to be in position prior to the birds beginning calling. The young birds usually begin calling first, with the Old Hen chiming in later to let them know which tree she is in. Once the birds begin calling, join in the conversation with them. Mimic the old hen by using long, raspy yelps. The Kee-Kee or “Kee-Kee Run” is a call primarily used by the young birds to locate one another, and is often referred to as the “lost call”. Other names I have heard for it include the “turkey whistle” and the “wildcat call.” It can be reproduced on all types of turkey calls, but I prefer a crystal or aluminum slate or a ghost-cut mouth call. Mimicking the old hen and the young birds at the same time creates the illusion that the group is getting back together at your set-up, which is the illusion you should be trying to create. Ideally, the turkeys will attempt to get back together within gun range of your position. Oftentimes, the young turkeys will fly from tree to tree to your location, and may not light on the ground until they actually see another turkey. This may require shooting a turkey out of the tree. This is often problematic, as it can be very difficult to determine if a young turkey is a jake or a hen. Of course, if you can see a beard, this problem is solved. A young jake’s beard in the early fall, being only an inch or two, may have the appearance of an out of place feather. Take as much time as possible and study the head of the turkey, as a young hen will have feathers much further up the neck and head than a jake. In an ideal situation, multiple turkeys will be together and you will have the opportunity to compare them. A successful fall turkey hunt involves locating, scattering, and calling the birds to the gun. Success is rare, but extremely rewarding. Good luck this fall!